Do you long for a tropical get away? If sipping a delicious pina colada while kicking back on the beach is your idea of heaven... we have the soap for you! Even if staying in and enjoying delicious slice of coconut creme pie is more your speed, this soap will hit the spot. 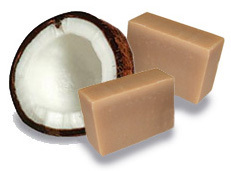 If you love the delicious aroma of coconut this soap is for you.